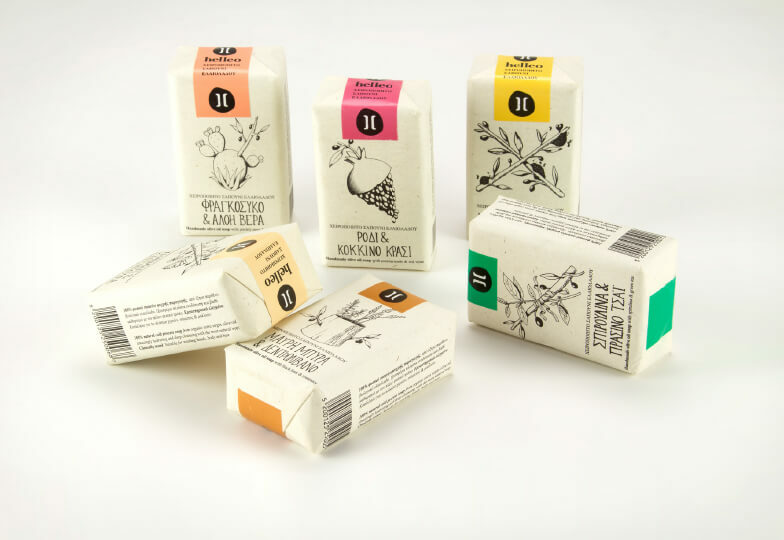 Each blend of helleo soap consists of 80% olive oil while the rest 20% is a blend of natural oils and only pure ingredients who co work with the olive oil. For a 120g bar of soap we use about 400 olives of Koroneiki variety, renown for its high quality and strong anti-inflammatory properties. The soap is made using the cold process, the purest method used for cosmetics, and is naturally cured for several weeks. This way, all the luscious properties of the individual ingredients retain intact. Helleo soap, thanks to its composition, deeply nourishes human skin while it penetrates it without clogging pores. Moreover, it is rich in glycerin, which is naturally formed and makes the final soap a perfect skin moisturiser, due to the glycerin’s tendency to absorb water from the air. The high content percentage of polyphenols and oleic acid, makes helleo soap a powerful natural anti-aging product. Cleansing skin gently and effectively without stripping away the desirable natural oils produced by the skin, which tend to decrease with age, it also prevents the appearance of new wrinkles, while smoothing any existing ones. Rich in vitamins A and E, helleo soap has powerful antioxidant properties, which fight the free radicals responsible for various health problems. It’s natural substances reduce oxidation, repair damaged cells and gradually helps body produce essential proteins and give your skin a youthful look. The complete absence of parabens and other unsafe ingredients and the 100% natural synthesis of helleo soap in combination with it’s high olive oil content, makes it profoundly hypoallergic, minimising the possibilities of an allergic response while using it. Helleo soap is completely mild and gentle, making it suitable for newborns and children. Even the most sensitive skin will absorb the healing and nourishing properties of helleo soap.